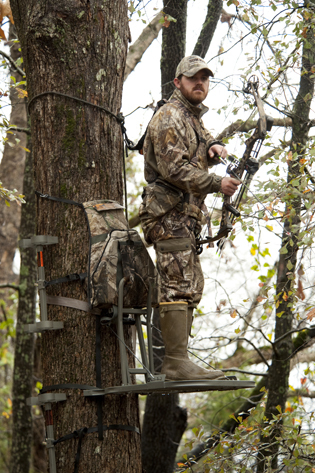 These days when it comes to hunting from a climbing treestand, comfort and safety are of paramount concern. 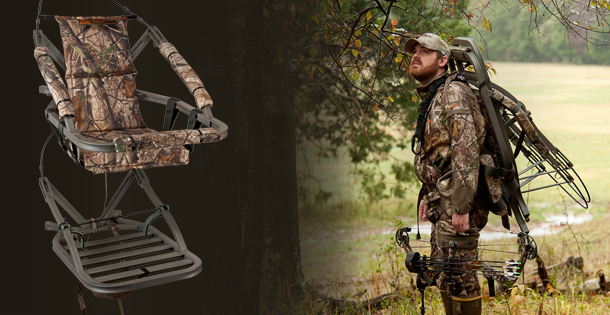 It is reassuring to know that you can put your mind at ease, knowing that your treestand is going to hold you up because it is built with the best materials available! For large-sized hunters, finding a treestand with enough room for comfort—and the capacity to support a weight limit of up to 350 pounds—has been a challenge. Well, thanks to Summit’s Goliath SD, for hunters looking for a full-featured climbing stand that will support more weight, or just give you some extra room, you’ve found your match. The Goliath has thick padding to keep you comfortable for long sits all day long! This incredible climber features a solid front bar that makes climbing easier and doubles as a gun rest. This rugged climber also features our trademarked QuickDraw cable retention spring that ensures the cable remains in the preferred slot during climbing. Our unique RapidClimb Stirrups allow you to quickly slip your feet in them for climbing, and then conveniently slide out of the way when not in use. Thanks to our Summitlokt technology our stands will still maintain their structural integrity even if a weld were to break. This is accomplished with our perimeter bar and tubing that is engineered to “pinch” together for safety. With our trademarked Dead Metal Sound Deadening Technology, our stands are lighter and stronger, but yet feature less resonance and vibration than other stands. You’ll have to not hear them to believe them. In a nutshell, the Summit Goliath SD may be the best climber ever made. Visit your local Summit dealer and check one out.